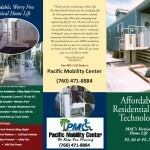 Pacific Mobility Center has been offering Mac’s Residential Vertical Lifts for over 20 years now. These taller units were designed and engineered for reaching an upper level or raised deck or porch. Our professional staff is trained to install this equipment safely. This equipment is easy to operate, easy to install and virtually maintenance free. Every safety detail has been carefully designed in the Mac’s Vertical Home Lift including a non-slip platform, constant pressure switches, a low platform for easy access, safety ramp and railing with all rolled edges. Standard lifting height 50 inches, with other extended options available.